David Brooks of The Streams and Pete Riccio of The Sawtelles will play solo sets at Best Video Performance Space on Thursday, Oct. 11. The show starts at 8 PM and the cover is $5. The Streams play furious to contemplative story songs, many centered around American historic themes. The instrumentation is grounded by a solid rhythm section with some folky flourishes of mandolin, banjo and organ generally accompanied by raging electric guitars. The songs are tightly crafted pop rockers and lyrically run the gamut from blisteringly pompous war cries to quiet acoustic meditations on loss and heartbreaking destruction. Pete Riccio is songwriter for The Sawtelles, a trio that features his wife Julie on drums and BVFCC Executive Director Richard Brown on guitar and sax. Riccio, a drummer by training, plays guitar and sings in The Sawtelles, crafting his tunes from a bevy of alternate tunings on guitar. This is a rare solo appearance for him. 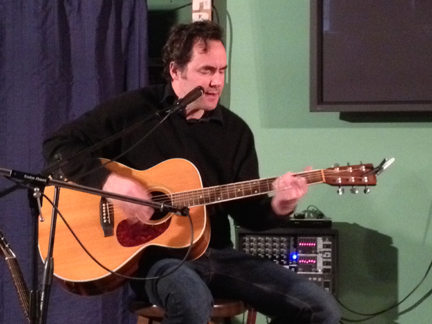 Singer-songwriter Dave Brooks of The Streams plays a solo show at Best Video Performance Space on Thursday, June 15. The show starts at 8 PM and the cover is $5. The Streams are a four piece rock group formed in 1991. The group is headed by Dave Brooks with his band of grizzled veterans including: Dean Falcone (The Shellye Valauskas Experience), Jeff Wiederschall (Miracle Legion) and New Haven guitar dazzler, Bill Beckett. (For this show, Brooks will play solo.) They recorded an album of driving rock called, “Today, I Died,” available now at itunes.com and most other online music sites. “Today, I Died” featured songs dealing with Civil War themes, inspired by Brooks’ viewing of Ken Burns’ PBS series. Most of the new material is more personally oriented. The Streams play the Best Video Performance Space on Thurs., Oct. 24. The music starts at 8 PM and the cover is $5. 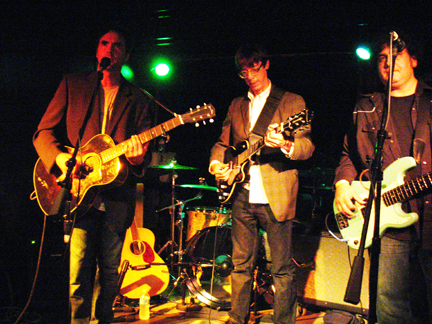 The Streams are a four piece rock group formed in 1991. They recorded an album of driving rock called, “Today, I Died,” which sat on the shelf for a decade and a half before finally seeing release two years ago. It is available now at thestreams.net, itunes.com and most other online music sites. The group is headed by Dave Brooks with his band of grizzled New Haven music scene veterans including: Dean Falcone (Shellye Valauskas Experience), Jeff Wiederschall (Miracle Legion) and New Haven guitar dazzler, Bill Beckett. The songs on “Today, I Died” derive inspiration from the pages of Shelby Foote’s history of the Civil War, which gave a detailed and personalized view of the times devoid of political fence hopping, and the Ken Burns visual history of the Civil War, which also brought a unique and human perspective. Recorded simply and with not a lot of studio affectation to eight- and sixteen-track tape in the l1990’s, the record still sounds vibrant and contemporary in the 21st century notwithstanding its 19th century subject matter. The songs are chiming, heartfelt, rocking. One hears the sweat, the fear, the courage. The instrumentation is grounded by a solid rhythm section with some folky flourishes of mandolin, banjo and organ generally accompanied by raging electric guitars. The songs are tightly crafted pop rockers and lyrically run the gamut from blisteringly pompous war cries to quiet acoustic meditations on loss and heartbreaking destruction. While songs from “Today, I Died” are centered lyrically around the American Civil War, Brooks’ current tunes are more personally oriented. But they share with his older songs a strong individual musical vision. Best Video manager Richard Brown (then and now, in photo at left) turns 60 this night and to celebrate he has invited a number of his friends from a life in music to come and play. Admission is $10, which includes food and cake! All are welcome to join us for a night of fun and music. 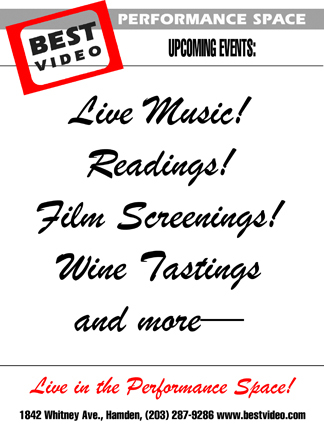 It will be a gala event featuring renowned area groups The Furors, The Streams and Happy Ending (which features Richard on guitar and sax and Best Video employee Hank Hoffman on guitar and vocals). Richard will be playing some songs with each group as well as with Steve Chillemi, his former bandmate in Tynkankow and Looking for Jobs. Comprised of guitarist Derek Holcomb and drummer Tom Dans—Holcomb sings lead and Dans harmonizes—The Furors have been playing together for over three decades. They have self-released numerous vinyl 45s, a vinyl LP and several compact discs. Their catalog is so beloved among local musicians that a tribute album, “Let’s Get Furious,” was released in 2003 featuring 38 Furors songs covered by 38 local musicians and groups. The Furors’ music is joyful, quirky three-minute pop, like a cross between They Might Be Giants and early British Invasion rock ‘n’ roll. 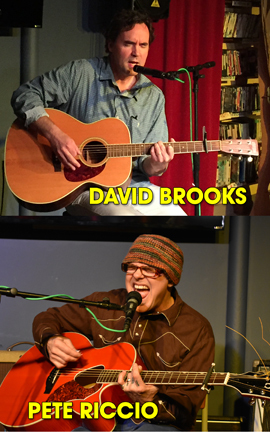 The Streams—Dave Brooks, Bill Becket, Jeff Wiederschall and Dean Falcone—play furious to contemplative story songs centered around American historic themes. The instrumentation is grounded by a solid rhythm section with some folky flourishes of mandolin, banjo and organ generally accompanied by raging electric guitars. The songs are tightly crafted pop rockers and lyrically run the gamut from blisteringly pompous war cries to quiet acoustic meditations on loss and heartbreaking destruction. 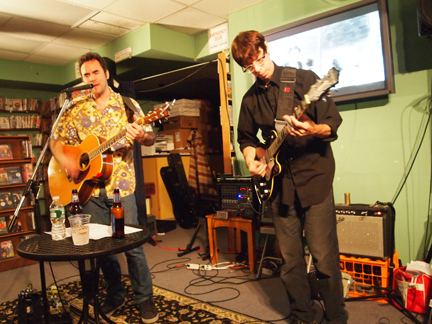 Happy Ending plays electric rock ‘n’ roll, mixing original compositions influenced by garage rock, folk rock and psychedelia—oftentimes with a political slant—with cover songs from the 1960’s and 1970’s. Happy Ending has released two albums—the vinyl LP and 45 “Have A Nice Day” in 1984 and the compact disc “Smile for the Camera” in 1996. 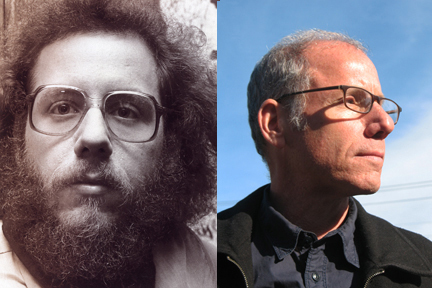 John Foster, editor of Op Magazine, described “Have A Nice Day” as a “future cult item for the collectors.” Hank Hoffman sings and plays guitar; Richard Brown plays guitar and alto saxophone. Tom Smith is on drums and Randy Stone plays bass. Steve Chillemi is a multi-instrumentalist and vocalist who has performed with Tynkankow, Looking fore Jobs, Doctor Dark and Fuchsprellen, among others. The Streams will perform in the Best Video Performance Space on Thursday, Feb. 21. The music starts st 8 PM; the cover charge is $5. The Streams are a four piece rock group formed in 1991. The group is headed by Dave Brooks with his band of grizzled veterans including: Spike Priggen (Dumptruck), Jeff Wiederschall (Miracle Legion) and New Haven guitar dazzler, Bill Beckett. (For this show, Brooks and Beckett will play as a duo.) They recorded an album of driving rock called, “Today, I Died,” available now at thestreams.net, itunes.com and most other online music sites. The Streams play furious to contemplative story songs centered around American historic themes. The instrumentation is grounded by a solid rhythm section with some folky flourishes of mandolin, banjo and organ generally accompanied by raging electric guitars. The songs are tightly crafted pop rockers and lyrically run the gamut from blisteringly pompous war cries to quiet acoustic meditations on loss and heartbreaking destruction. Most of The Streams songs are centered lyrically around the American Civil War. Many of the songs derive inspiration from the pages of Shelby Foote’s history of the Civil War, which gave a detailed and personalized view of the times devoid of political fence hopping, and the Ken Burns visual history of the Civil War, which also brought a unique and human perspective.